All transactions are safe and secure with a reliable history in online purchasing behind each of our associates. 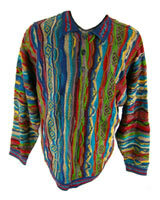 Buy the Bill Cosby Sweater - Cliff Huxtable Coogi Sweaters to own Cosby Show clothing and merchandise. As a fan, you know that Dr. Huxtable typically wore either college sweatshirts or Cosby sweaters. Most of the latter were brightly colored Coogi sweaters like the ones available here. Not only can they be worn for fun and warmth, but they are also ideal for an eighties theme party, an ugly sweater party or as a jaw-dropping Bill Cosby costume at Halloween. People will love the original idea. Don't miss the Hillman College t-shirt for another great option. In addition to the Bill Cosby Sweater - Cliff Huxtable Coogi Sweaters above, browse the Cosby Show Clothing Gallery for more apparel like men's and women's clothes, kids shirts or hoodies.